Description The comb is painted on one side with two roundels containing peacocks, which flank a cheetah: the terminals are painted with circles. The reverse side is treated with a long rectangular panel of scroll ornament and circle decoration. 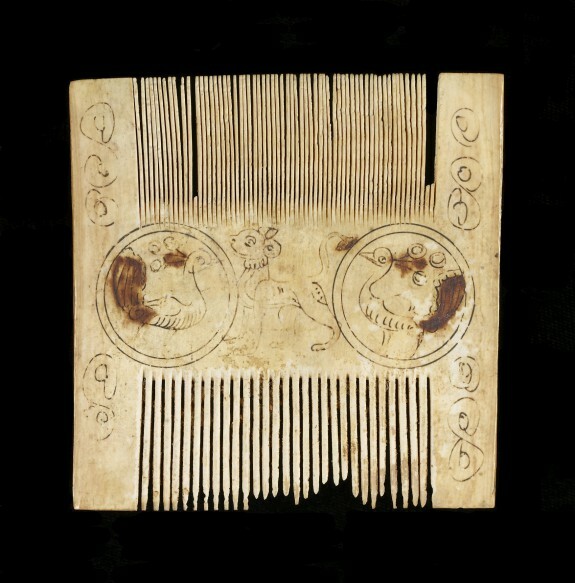 The comb possibly had a liturgical use, since two nearly identical combs survive in the treasuries of S. Trinitá, Florence, and the Cathedral of Roda, Spain. All three have been attributed to the same workshop. Two teeth are missing on one side, and the tips of the teeth on the other side are broken in a jagged line. The tails of the peacocks and the lotus pod were painted brown, and there are traces of gilding. Provenance Acquired by William T. or Henry Walters, Baltimore; by bequest to Walters Art Museum, 1931.